Taylor, Benedict 2016. Mutual Deformity: Ignaz Moscheles's Seventh and William Sterndale Bennett's Fourth Piano Concertos. Music Analysis, Vol. 35, Issue. 1, p. 75. Tanner, Mark 2000. The Power of Performance as an Alternative Analytical Discourse: The Liszt Sonata in B Minor. 19th-Century Music, Vol. 24, Issue. 2, p. 173. 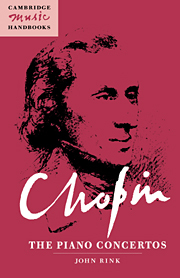 Chopin's E minor and F minor Piano Concertos played a vital role in his career as a composer-pianist. Praised for their originality and genius when he performed them, the concertos later attracted censure for ostensible weaknesses in form, development and orchestration. They also suffered at the hands of editors and performers, all the while remaining enormously popular. This handbook re-evaluates the concertos against the traditions that shaped them so that their many outstanding qualities can be fully appreciated. It describes their genesis, Chopin's own performances and his use of them as a teacher. A survey of their critical, editorial and performance histories follows, in preparation for an analytical 're-enactment' of the music - that is, a narrative account of the concertos as embodied in sound, rather than in the score. The final chapter investigates Chopin's enigmatic 'third concerto', the Allegro de concert.Chopin: The Piano Concertos has won the Wilk Book Prize for Research in Polish Music.